You need good timing and skillful boat handling to moor a dinghy The helmsman must bring the boat to a halt alongside a mooring buoy and hold it there for long enough to give the crew time to grab hold of the buoy and attach the mooring line. The helmsman should approach at low speed while maintaining full steerage and control. Use whichever element is strongest—wind or tide—to stop the boat alongside the buoy, with sails fully depowered. To assess the strength of wind direction or tide, look at which way other moored boats are lying. A pick-up buoy will lie down-tide of the main buoy —the stronger the tide, the more it will be stretched out and pushed under water. The crew will need to grab hold of the buoy and attach the mooring line. If there is no tide, approach from downwind, roll the jib, and bring the boat head to wind when the buoy is on the windward side of the bow. 1 Approach the buoy slowly. The mooring line should lead from the bow to a position by the windward shroud, so the crew can get the line on to the buoy quickly. come head to wind with the jib rolled. The boat needs enough momentum to stop when the buoy is next to the windward shroud. If you are moving too fast, sail around again. 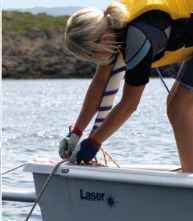 Always carry a small folding anchor, which can be stored easily and will not damage the boat. When approaching the anchorage, furl the jib and control speed with the mainsheet. Let the mainsail fly on a close reaching course, with the boat pointing into the tide or into the wind to stop the boat. drop the anchor and let the boat fall back on the anchor against the wind or tide. IDrop the anchor, hand over hand, until it grips the bottom. Hold it well clear of the bow to prevent damage. Ensure the anchor is attached to the dinghy. Leave sufficient space around the anchor for the boat to swing on the wind. Be aware that the wind may change direction in the afternoon. Lift the centerboard and roll the mainsail inside the cockpit. 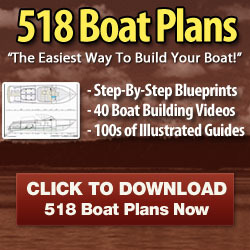 2 Most dinghies have no mooring cleat on the foredeck. The steel hoop at the mouth of the spinnaker chute may provide a good option for attaching the anchor. If the boat is pointing into wind, you can hoist the mainsail on the mooring. Lower the centerboard, pull up the anchor, then unfurl and back the jib to make the bow bear away on to a reach. If the boat is lying awkwardly to wind and tide, you may leave the mooring under jib, with only a small part of the mainsail raised to help provide steerage. Then turn head to wind to hoist the rest of the mainsail. Gradually pull in the anchor rope and chain. On a dinghy this should not require great effort.